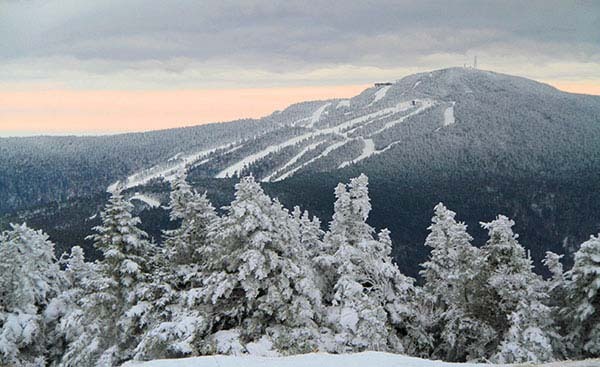 Pico Mountain, sister resort to Killington and neighbor, has a warm, historical feel (opened Thanksgiving 1937), but offers modern lifts, sweeping trails and fantastic summit views. Pico offers a quieter ski experience than Killington, with less skier traffic and a very friendly atmosphere. Pico Ski Area has one central base, proximate parking and walk to slope condominium lodging with a Sports Center with indoor pool. Pico is less hurried than Killington and ideal for skiing families with excellent learn to ski and snowboard schools plus childcare. Pico’s 57 trails, with two well placed high speed quads, and almost 2,000′ vertical, are not small- but feel very manageable. Trails are well groomed, and super scenic like Pike and Forty Niner, KA and Sunset all from the 3,966′ summit. The Golden Express quad takes you from the base to mid mountain where you can ski over to the Summit Express Quad or enjoy gentle slope ski trails like Panhandler, Fools Gold and Prospector. Point out the fun the mining references to the kids. The Outpost Double chair serves natural snow trails like Outlaw glades and Sidewinder. Pico’s classic base lodge offers food service, the Vermont Ski and Snowboard Museum ( a smaller version of the original in Stowe), and the Last Run Lounge upstairs with a stone fireplace and a view of the slopes so you can watch the kids while you sip a hot toddy. Legend has it that Harry Chapin grew up skiing Pico and would play his guitar by the fire for après ski before he became Cats in the Cradle famous. Pico exudes that friendly feel, a real family place. The Andrea Mead Lawrence Lodge at Pico, named for the US Ski Team racer who grew up skiing Pico’s slopes which her parents owned serves as the race center and Adaptive Ski headquarters, opened in 2015. Tell your kids while they are skiing Pico that Andrea first competed at 15 in the 1948 Winter Olympics, taking eighth in slalom. In 1952, as the U.S. women’s team captain, Andrea was the first US ski racer to win two Golds. Pico is very proud of their youth ski racing heritage. Pico has a strong race heritage and a super friendly family vibe. Its really the antithesis of the high speed, busy ski resort next door at Killington. 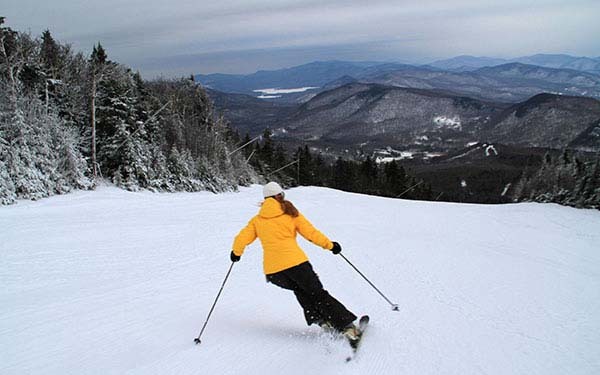 Someday Killington and Pico may have interconnected ski terrain, but big connection plans move slowly in the green state of Vermont. 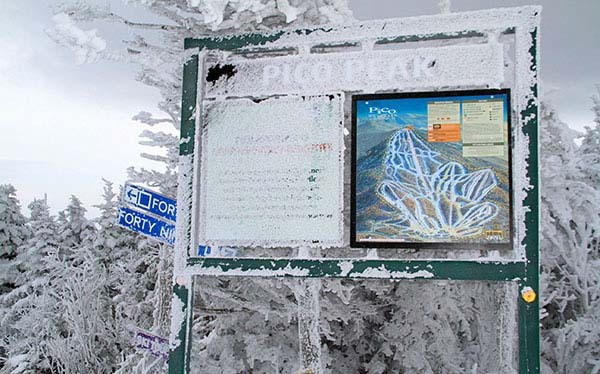 For now, enjoy the interchangeable ski tickets, you can ski Killington in the morning, stop for lunch on Killington’s Access Road, and head to Pico for the afternoon even.